G’day Ying17, alphahavoc and Joe Ng. Welcome to my thread and how I do things. First my disclaimer not so much for you guys but more for anybody else popping in. [B][I]What I am doing here is nothing new. Sorry but I’m not going to be able to teach you anything. Everything I describe from here on in you’ll be able to research yourself. And you’ll have to. All work and reference here on in is to the EURUSD pair. And one last word, unless you are a bipolar, dyslexic Gemini, don’t try and trade like me. You’re not me. But if you are certified and have the documents to prove it then give this a try. You’ll love it. OK. So here we go. This thread is how I trade. Been a while since I been here but the purpose is not to educate but to document. I trade ticks because I believe time-based candles are distorted by volume. It’s like listening to AM radio instead of FM. So by changing how my information arrives at me, I get a much cleaner reception therefore improving the quality of my trade decisions. Volatile and liquid markets quickly expose themselves with increase body size and rapid formations. Slow, stall markets present with small body’s forming over long periods of time. My interest on the chart, price and time. At the end of the day, that’s the only two bits of information the chart or the market can give us. I’m also the prodigy of Bob Volman. His book sits on my desk and is my bible. I read from it every day. So onto what’s on my chart and the indicator I use. So the chart is 70 tick chart. I have heavily experimented with tick volume numbers. Different brokers filter their incoming tick data. My broker IC Markets is one of them. Recently we identified that tick volume was almost half that compared to FXCM. But I had a bad experience with FXCM and have nothing but praise for IC Markets. I changed my tick volume down to 34 but found no real advantages. For some reason, even with filtering , 70 seems to be the magic number. I reserve the right to change my mind on this in years to come. Now a couple of tricks. First, I’ve adopted a 4 digit price feed. It produces a far superior candle, cleaner lines, cleaner body, cleaner highs, and lows. Brokers ain’t dumb. And unless you’re on their “A” books they’ll always be on the opposite side of your trade. Everything they do is carefully planned and done for a reason. Including introducing the 5 digit price feed. Second trick. Manually set the chart price scale. The designers of MT4 didn’t set an automatic default scale cause it looks pretty. It distorts the price/time scale making moves look more aggressive than what they are luring in the unsuspecting. I like to have a range between 80 -100 pips. I call it Bob’s Magic Boxes and the boxes never lie. Well, they do but then again all indicators do. It’s custom built by the world’s worst programmer, me. But it does the job I need it to. Probably cost me $700 in lost trades and months of work to get it to this stage. It won’t be the version I will be using a month’s time. Indeed, the next build is just about complete. But I’m happy to share because very few will understand how to use it and even less will be able to trade with it. I built it to trade off-line tick charts but it also works well on the 1min, 5min and 15min charts. The indicator is to help “train” my eyes in identifying conditions set up in Bob Volman’s book. So double doji, block boxes and ranges. But many other trading patterns like Harmonics and Chart Patterns can be identified within the box. The logic of a box is quite simple. There is no secret or magical formula buried deep inside. It’s all pure price action and it references only price and time. First, we set out to identify temporary stalling in price negotiations. These are identified on the chart as solid boxes and I call them scalping boxes. My definition of scalping is old school. You place a trade, cross the spread, recover costs and exit immediately you are in profit. Very, very hard for the average home speculator to do. Indeed, I would go as far to say as impossible. It’s not what I want to do. But for those who think they can out-play the market the theory to trading them is very simple. Once a scalp box has formed, enter a trade in the direction of the break and exit in profit. These boxes, however, are my trigger boxes. When a setup appears on the chart, wait for a scalp box then enter if price breaks it the direction I want to trade in. The second type of box we want to identify is the range box. These are identified by the outlined boxes. These form during a “supply” period on the charts. Supply zones are easily identified. Price moves from a level, in a short sharp move, to a higher or lower level. It then retraces back inside these two levels and trades as a supply zone is established. This might exist for a matter of minutes as stupidly huge volumes of cash exchanges hands. It might play out over hours as the players position themselves . The theory here is that the market will continue to trade within that zone until supply has run out. It will then break that range in the direction of the next supply zone and set up a new range. But we are all familiar with fakeys. All these patterns share the same trait. At trait, we can define in an algorithm. They start with a short yet powerfully X-A leg. The price then trades within that legs extreme forming new swing highs and lows yet never breaks. This same logic also defines a scalp box. a series of at least three candles where the highest high and lowest low of the first two candles form the upper and lower range of the box and the third candle’s high and low form within that range. That range should ideally be between two to three pips only. Let’s evolve that definition. A box now has 3 components. An X-A leg, a run leg and a range. The X-A leg will define the box as a scalp box or a trade box. It is formed over a number of bars denoted as “n” where the first bar and last bar form the high and low of the box. The number of bars “n” defines the box. 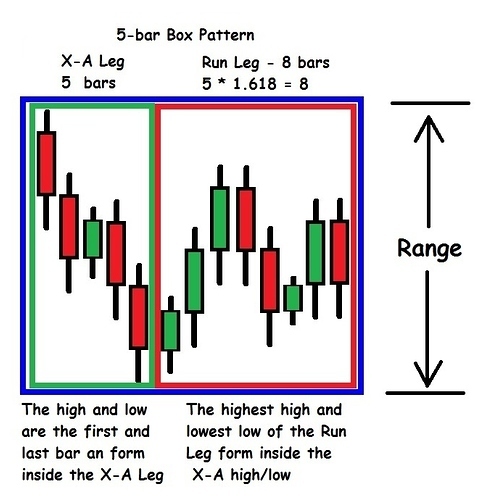 So if the X-A leg was 5 bars, we would call it a 5 bar box pattern. If the X-A leg formed over 21 bars, we’d call it a 21 bar box pattern. Scalp boxes form when the X-A leg is low, only 1, 2, 3, possible 4 bars. Range boxes form over much larger periods. The run leg must satisfy two conditions. First, it is formed over a minimum number of bars calculated as “n” multiplied by a factor. That factor is up to you to work out. For the moment, we’ll use a favorite number of mine and the one I’m using in the indicator, 0.618. Look familiar. It should. Using Fib times has a whole new meaning on tick charts. So a 5 bar box must have a run leg of at least 3 bars, the 21 bar box must have a run leg of at least 13 bars. If we set our factor to 1.618 a 5 bar box would now need at least 8 bars to form. The 21 bar box would need a run leg of at least 34 bars to be valid. There is no maximum to the run leg, as long as the second condition is met. That’s pretty simple. The highest high and lowest low of the run leg must be within the boundary set by the high and low of the X-A leg. Once those levels get broken the pattern is immediately void. The final factor to determine the validity of a box is a range. The difference in price between the highest high and the lowest low expressed as pips or points. I’ll use pips because I’m working with a 4 digit price feed. Scalp boxes for in a very narrow range. 3 pips to be precise. We’re trying to identify when market negotiations stall. Remember each tick represents one transaction that has moved the price by a digit. For each transaction, that achieves that there could be much more simply occurring at a price smaller than your broker’s feeds. My understanding is price can be negotiated down to at least 18 digits in the real world of the “exchange”. When negotiations stall within this narrow range, liquidity has temporarily left the market with the players not prepared to commit to forcing price direction. The real players see this and are ready for action. You need to be as well. For as soon as this range breaks price will move quickly in the direction of the break. But beware of the fakey. The real players are a nasty horrible group of people and will do anything to get the edge. And they run at least 1/2 a second faster than we can every hope for. Range boxes form over a larger range but within a maximum. The tighter the better. Personally, I like to see a range less than 13 pips but have the indicator set up to identify ranges of up to 21 pips. When the market enters one of these supply zones, liquidity again tends to dry up. Small volumes of money are been exchange and price bounces back and forth forming these swing highs and lows. Very hard to trade from. But when liquidity returns price quickly moves with it, breaking the range opening up trade opportunities. Other features built into the indicator. First trend direction. The boxes are color coded. Green means an uptrend is present. Red, a down trend. Defining trends are very simple and uses generally accepted the definition of higher highs and lows in an uptrend, lower highs, and lows in a downtrend. By comparing the high and low of the current box to the previous box the indicator determines the trend. This applies to both scalp and range boxes. If there is no clear trend we get a wait box. I also have some data displayed. The current box high and low displayed as the upper and lower level. The box range so I can measure strength and for trade size calculations. The upper and lower step which are TP targets and simply the upper level plus range and lower lever less range. This gives me my 1:1 RR ratio and helps evaluate potential. I won’t take a trade unless I think it will achieve at least this movement. Final Tick valve. My account is AUD, I trade the EU pair. Things happen very fast down here and I need to have all the information ready at hand to calculate correct position size. Future builds I plan to identify different types of ranges and measure candle properties. Market liquidity is easily identified on tick charts. Ill-liquid markets have small candle sizes general 1 or 2 pips. The body even smaller. When liquidity returns candle size increase to 3, 4 or more pips. And the body is often as large as the candle itself. Trading in a liquid market definitely gives you an edge. How I trade has evolved. Although Bob Volman’s teachings are at the heart of what I do, this methodology has stepped up to include 4 key concepts. [B]Box[/B] [B]Patterns, trend lines, price patterns [/B]and[B] content[/B]. It is [B]purely[/B] a [B]discretionary system[/B]. There are no fix trigger signals to enter or exit. [B]It’s done by instinct[/B]. Instinct that has been developed after hours upon hours of screen time. Doesn’t mean one is glued to the screen all day every day. It just means one must be at their screen when one trades. There is no other way. And always happy to answer any questions best I can. Great stuff. Lots of your own knowledge in here which I find very enlighting . especially the trading with the trend with your own bias. I exclusively trade using mobile phones. Hence , ain’t sure if I can get any tick chart coming along . might get a laptop . I did some research on tick volume and lower tf chart . what you explains here. Makes sense to me. I like to think that the tick chart is indeed a combination of tick volume, price by time. Lets see how we go. Bang on New York open Short @ 1.13691, 10 pip SL N TP. Try a long today. In @1.14050, 10 pip stop, might leave TP open for the moment. Stop moved to 1.1420 and taken out, 15 pips locked in. That covers yesterday’s mishap. Sometimes you take a trade and you just have to have faith in one’s system. This is such a trade. At this time of day don’t like placing trades 5 mins before the hours end. Normally like to find an opportunity in the first 15-20 mins of the hour. Also, it’s always tuff after smoko in Europe. But if there’s a bottom forming at the 1.14 level now the time to enter. Can only wait and see. Nup. Stop taken out. Such is life. Another opportunity will emerge later. Until then I think I’ve got some paint drying somewhere. And closed. Back to square 1 today. We’ll see what U.S. brings. Stop moved to 1.1401 to lock in 10 pips. TP set at 1.1416 for 25 pips got to go deal with kids. Let’s get the day going with a short @ 1.13454, Standard 10 pip SL n TP. Don’t like trading at this time of day but the trades there and all boxes ticked - very bad pun. I think you have forgotten to add your 2 moving averages line in your chart. Could be useful. Hi bro. The two EMA’s where 34 and 55. Sometimes I put them on, sometimes I don’t. They are useful to train the eyes, especially if one is new to this style. Volman’s teaching is to use a 20 EMA. Again they’re an optional extra. Personally, I think one’s eyes can tell once trained. I’ve been using an updated version of my indicator this week. I’ve tweaked the scalp boxes to show double doji as blue. Bob Volman has a slightly different version of its definition. I’ve also tweaked the range boxes to have a fix run of 1.618 * n and graded them according to range size. I’ve attached it at the end of this post. This is why I don’t like and probably shouldn’t trade at this time of day. Markets can whipsaw in a narrow range at this time yet sufficient to take out my stops. Suppose it’s up the gods to what happens next. [B]Is it a reversal, is it a pullback?? The fact my stop got taken out doesn’t worry me. As I said I shouldn’t trade at this time of day and I had a chance to get out so I just have to learn to be smarter. It’s the 15 point slip I suffered at the start of the trade that could hurt. So so so hate this pair. Just got to love it. Even luckier I managed to get in and out on it for 27 pip gain. Things can happy fast, real fast and you have to know how this pair moves. So lost 10 gained 27 plus 17 pips. that will do for the week. Some things you can control some things you can’t.